You may have noticed that my last Blanket Of The Month entry was in December of last year and so I’ve cleverly reinvented this blog as Blanket Of The Fiscal Quarter. It isn’t that I’ve been too busy to write. I’ve just assumed you’ve been too busy to read. Many people thought it would be a miracle if I ever wrote again. Hello, It’s Easter Sunday! I started the day with my traditional annual egg hunt and, as usual, found them in my refrigerator. It’s a great day to be an egg, but not nearly as good to be a banana. Do you happen to know what variety of banana you and everyone you know consumes? No, thank you, you don’t. It’s a Cavendish and it’s the #1 selling grocery item in the western world and has been since the 1950s when it replaced the previous king, the Gros Michael. The GM succumbed to a fungus that causes Panama Disease…banana wilt…and now a powerful new strain of that same fungus has attacked the Cavendish worldwide. Six hundred and twenty-nine Cavendish’s will die while you read this sentence. The International Banana Congress – yes, there is one – has a multi-billion dollar decision to make…out of all the thousands of varieties of bananas in the world what single superstar will have the taste, shelf life and shippability of the mighty Cavendish? I imparted all this information to a young man of perhaps 18 winters who was restocking the banana section of my local grocery store. Like you and your ignorant friends, he had no idea that virtually every banana he had ever encountered was a Cavendish. Clearly this was a teachable moment. I vigorously launched into the subject and perhaps fifteen seconds of Cavendish conversation transpired before the light started going out of his eyes as he began losing his will to live. A lot of folks think bananas and blankets don’t mix, but I’m not one of them. I actually have two things to share with you today. 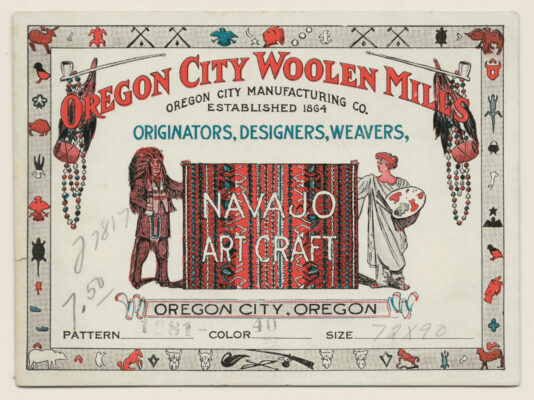 The first is a 1920s Oregon City Woolen Mills cardboard label that would have been attached to every trade blanket leaving the factory. 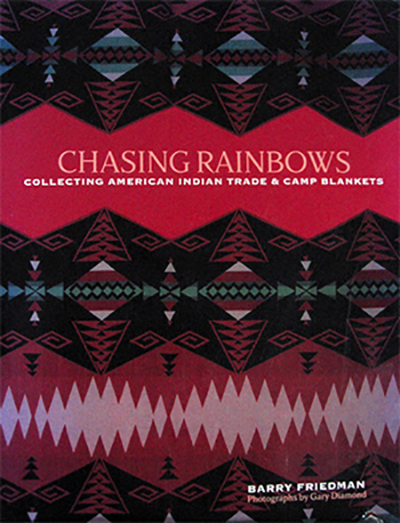 The design components on the borders are all found on the company’s famous Happy Hunting Ground blanket. 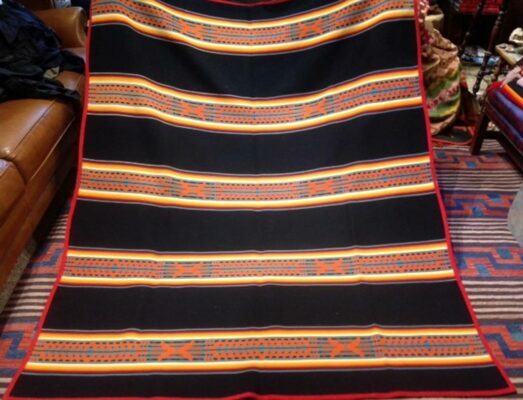 Just to sweeten the deal I’m adding a bad photo of a very good Oregon City blanket from the same era. 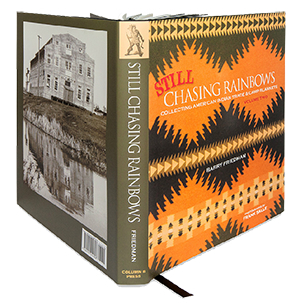 This banded pattern is quite rare and is in as-new condition. Seldom do I feature multiple items in the same post and I guess the only explanation is I’ve gone bananas! Yes, I hear your groaning and you’re not wrong.